Nick Carter, Master Detective was a crime drama based on pulp novels of the same name. 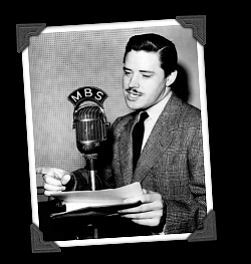 It aired on Mutual radio from 1943 through 1955 with Lon Clark (pictured) in the title role for its entire run. Other cast members included his loyal assistant Patsy Bowen (played by Helen Choate and Charlotte Manson), reporter Scubby Wilson (John Kane) and Sgt. Mathison (Ed Latimer). The half-hour shows were presented in a fairly straightforward manner, gaining their widespread appeal from the presence of clues provided throughout which could be used by attentive listeners to solve the whodunits. Episodes usually concluded with the detective narrating an explanatory tie-up of any loose ends.